Filigree mountings add delicacy and distinction to your engagement ring in a romantic and unique way. Elaborately decorated, these types of engagement ring settings make your entire ring a work of art to represent the love in your relationship. Click on the 'buy now' link at the bottom of an image in order to see purchasing information of the rings featured in this slideshow. Many types of solitaire settings incorporate additional accent stones or diamond chips along the side for more sparkle. Heart designs incorporated into filigree rings add a special, private touch of romance to your engagement ring. The hearts may be swirls of metal woven into the overall filigree, or simple hearts may be wedged beneath the ring's crown. Even the tips of the prongs can be shaped like hearts. The delicate details of a filigree setting are a stark contrast to the bulk of a black pearl, but together they create a lovely design with vintage appeal. A thick ring band may extend past the sides of the pearl, or the size of the pearl can match the thickness of the band for a more delicate appearance. Antique rings often have filigree designs, particularly from Edwardian or Victorian era rings when romantic filigree designs were popular. Many of these rings use semi precious gemstones instead of diamonds, since the bolder colors were more popular in those time periods, as well as being more affordable than diamonds. A ring with a high crown may use filigree accents along the sides of the mounting and band for beauty no matter which angle the ring is viewed from. Pave set gemstones add brilliance to the setting, and swoops of metal are a romantic touch. If this is the type of ring you're interested in, however, be sure to try it on first to ensure it is still comfortable on your finger. An engagement ring with a bold, unusual gemstone, such as a thick onyx, will look great with simple filigree elements. Gentle swirls and curves add feminine beauty and romance to a ring with a larger, dark stone, giving it a beautiful balance. Filigree rings are so unusual that it may be difficult to find a matching wedding band unless you purchase the rings as a coordinated set. When you look for your engagement ring, be sure to investigate what wedding bands are also available and suitable as a set. While a filigree mounting will add beauty to your ring, extra accent gemstones can give it an incomparable sparkle. Small diamonds or diamond chips can be worked into part of the filigree pattern as the center of swirls, or larger accent stones may be arranged as part of a more complicated setting. Filigree designs can be woven into figural shapes that can take the place of center stones. Flowers, hearts, and butterfly designs are the most popular and are perfect for a delicate and beautiful ring. If you prefer a less predictable but still symbolic figural design, opt for Celtic knots or a custom monogram woven into the filigree pattern. While many filigree rings are thick and bulky, delicate settings and textured edging can give the look of filigree to a thinner band. This is suitable for someone who wants a simple ring that still has a stunning pattern and romantic design. A very elaborate filigree ring can be quite expensive, but simpler patterns are usually more affordable. These patterns may be more open and have fewer details, but they are still unusual and eye-catching. Choose a colored gemstone instead of a diamond for an even more unique and lovely ring. The defining characteristic of classic filigree mountings is the open spaces within the ring's setting. These open spaces are usually between swirls and curves of metal, giving the ring a classic, vintage look. Pairing the traditional band with an emerald or square cut solitaire is a great way to bring the look up to date. This is a bold, edgy style perfect for a modern bride. Even if your engagement ring does not have a filigree pattern, you can still choose a filigree wedding band to pair with it. A dainty band with filigree can add elegance to a solitaire. 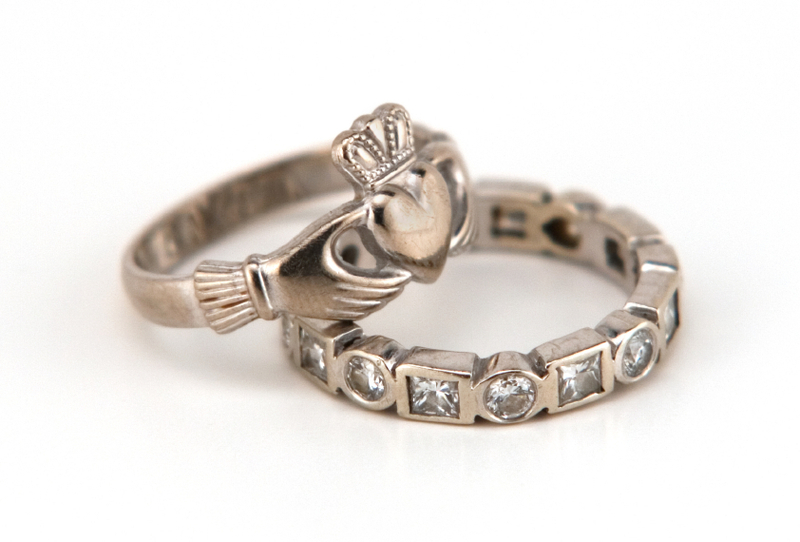 You can also opt for a ring set where both rings include matching filigree elements. Want more ideas for lovely engagement rings? Take a look at the Engagement Ring Trends Slideshow for the hottest modern styles!